My family loves eggplant, especially when I prepare a dish after roasting it on stove top, they like the smoky flavor. I have a thogayal/chutney, masial and another bharta recipe on the blog, but recently this has become the most favorite eggplant dish at home. 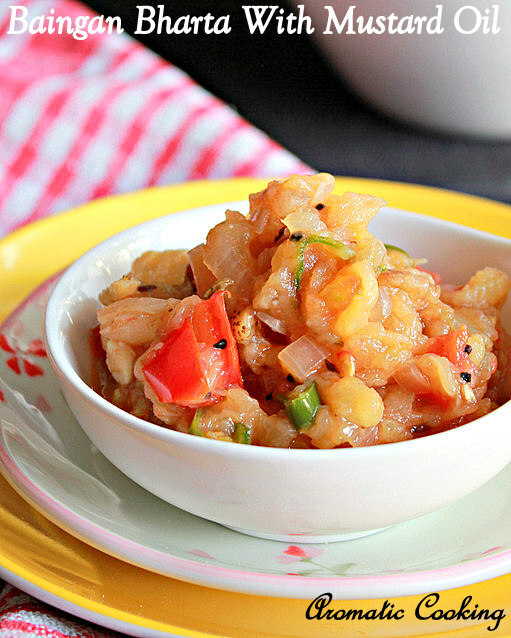 The dish is very simple, once the eggplant is roasted, peeled and mashed, the remaining can be done in just minutes. I have already mentioned that my daughter and I like dishes cooked in mustard oil, but since the husband doesn't like it if I use just mustard oil in a dish, I use a half and half mix of regular oil and mustard oil, and that way, he also likes the dish very much. This dish gets its flavor from the mustard oil and panch phoron used for seasoning and the bharta goes well with plain phulkas/rotis or even plain akki rotis ( without any added veggies, will post that recipe soon), do try this simple dish, the next time you cook eggplants..
Wash and roast the eggplant on low flame, till the outer skin gets charred and the inner part is cooked. Remove and add it to cold water, once it becomes cold enough to handle, peel the charred skin. Mash the eggplant and keep. Heat a mixture of regular oil and mustard oil, add the panch phoron, once it starts sputtering, add the garlic, onions, green chilly and salt and saute till the onions turn translucent, then add the tomato. Saute the tomato for 2 minutes or more, the tomatoes should slightly be cooked but should not become mushy. Remove and add it to the mashed eggplant, mix, check for salt and serve. Panch Phoron is an equal mixture of 5 spices, mustard seeds, cumin seeds, fennel seeds, fenugreek seeds and onion seeds/nigella seeds. 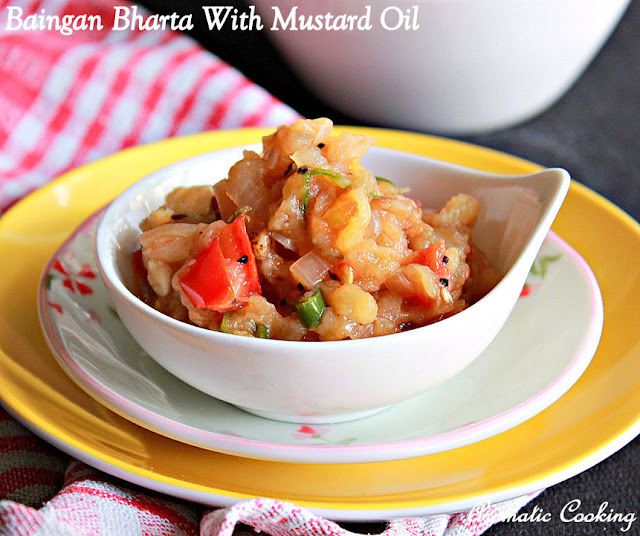 If you like mustard oil, then use just mustard oil, also you can drizzle some at the end. Roast the eggplant on low flame, then only the eggplant will be cooked at the same time that the outer skin gets charred, remember we are not cooking the eggplant after that. The tomatoes should not break down completely and become mushy. Even if you don't use mustard oil, the panch phoron will give a nice flavor, but mustard oil gives that extra kick. This sounds good, bharta in mustard oil.Smoky bharta is my favourite. Looks yum Hema love it. That looks healthy and very tasty, Hema.